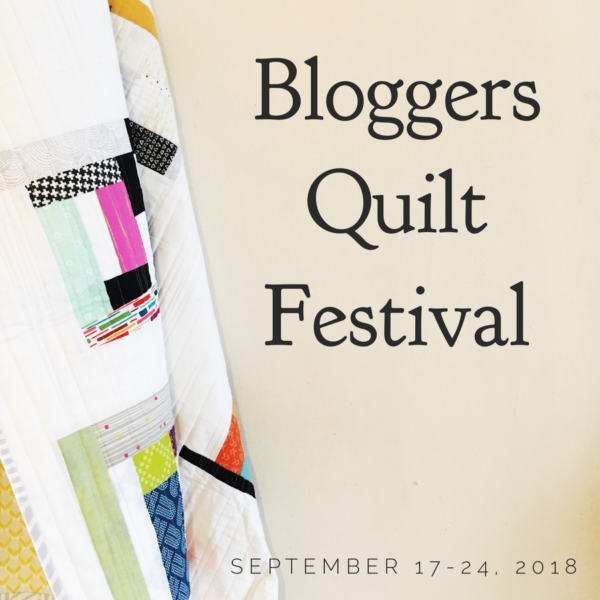 It's that time of the year, time for the fall 2018 edition of the Blogger's Quilt Festival hosted by Amy of Amy's Creative Side. 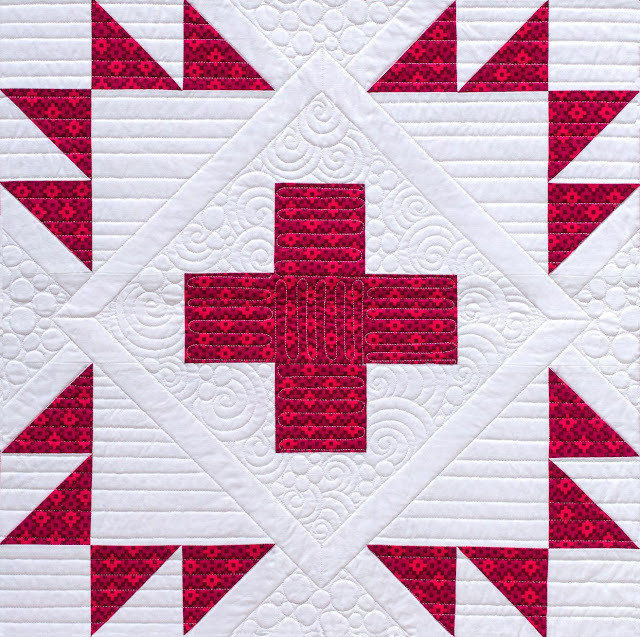 Bloggers can share two quilts of their choosing by writing a separate blog post for each quilt and linking to the festival link party. Bear Claw Plus is the second quilt I am sharing for the Blogger's Quilt Festival. Bear Claw Plus was designed by Cheryl (Meadow Mist Designs), pieced by me, and custom quilted by Johellen George. I just love this modern take on the traditional bear claw block. I was excited to piece this one and picked out an Elizabeth Hartman print from Rhoda Ruth in Petal and paired it with Kona Cotton in White by Robert Kaufman for high contrast. Here's a pretty stylized shot taken outdoors by C&T. 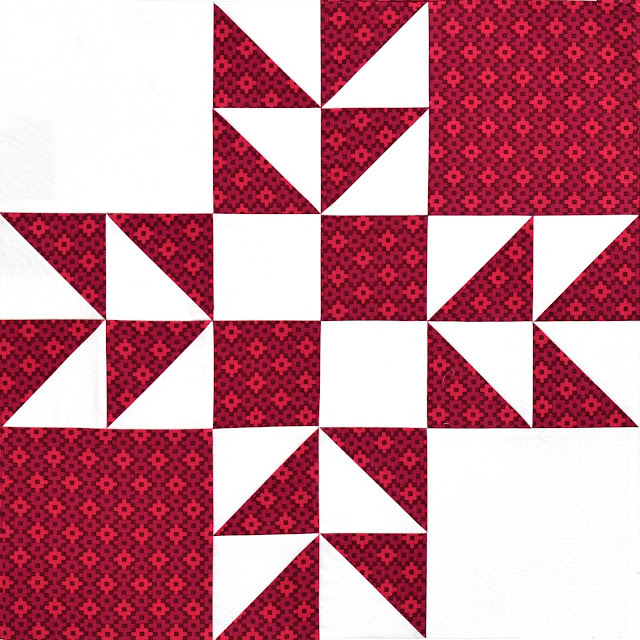 I also like the secondary star that is formed when the blocks are joined together. 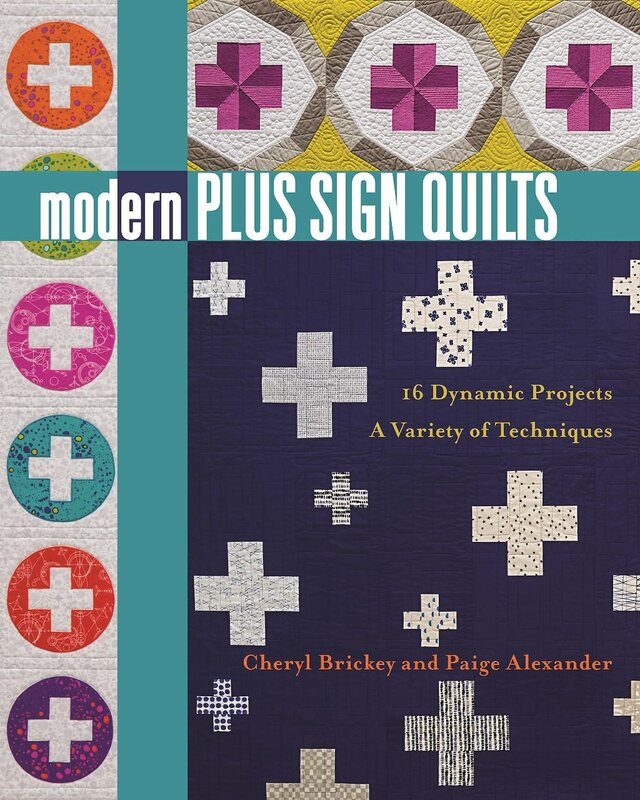 You'll find Bear Class Plus and 15 other plus sign designs Modern Plus Sign Quilts, co-authored with Cheryl Brickey. And, there's still time to join in the Modern Plus Sampler Quilt Along going on now. 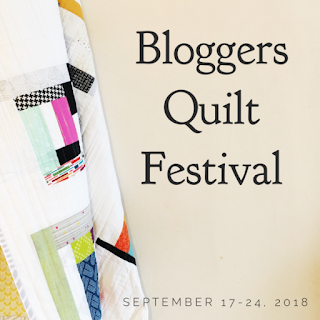 Please visit the Blogger's Quilt Festival over at Amy's Creative Side taking place September 17 - 24, 2018 where you can post two of your quilts (new blog posts written this week) and see the other beautiful quilts entered in the festival. I adore this quilt! It combines two of my favorite blocks--bear paw and plus. 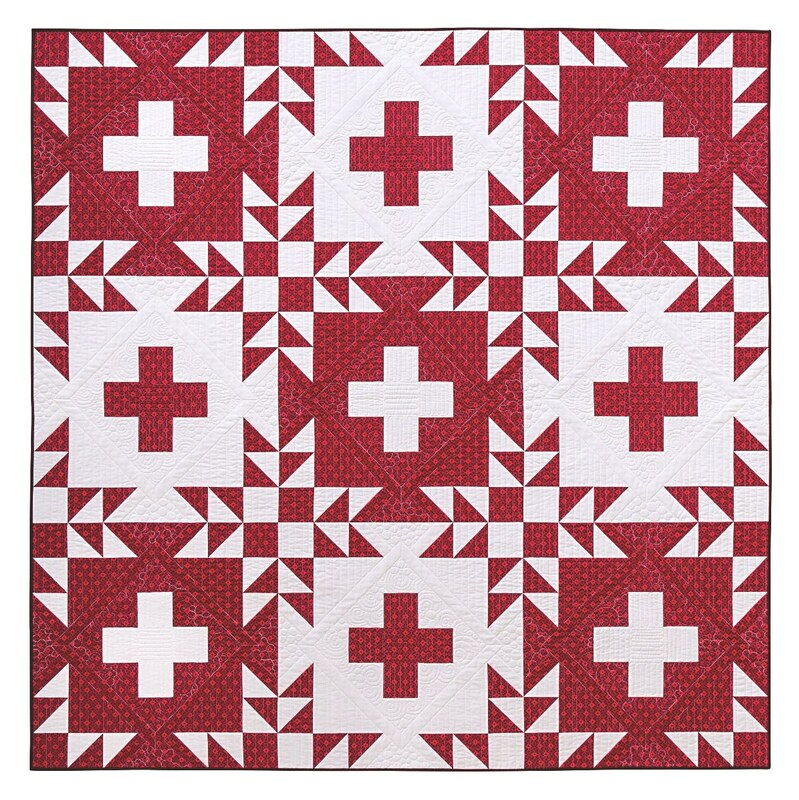 Nice quilting, too! Paige I never get tired of seeing your quilts. I love this one with it's secondary star, it took me a second to see it, but I love it. Very striking quilt! Love it!!! Wow this is a great quilt! 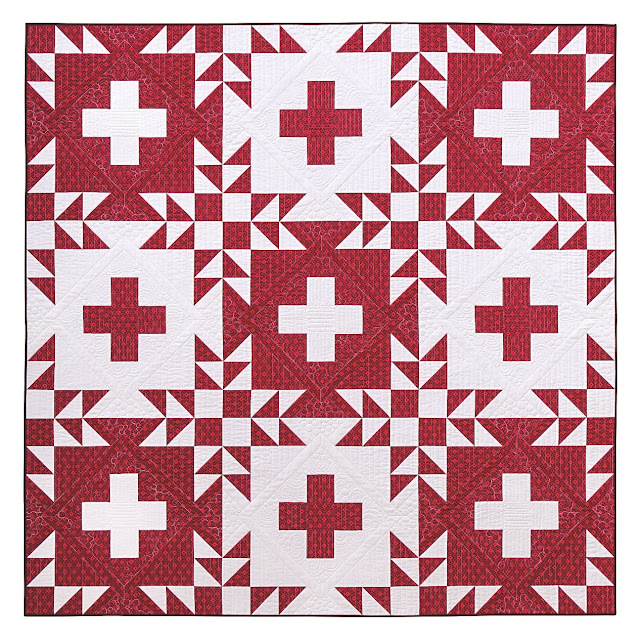 I've been starting to make a collection of red and white quilts and I am going ot have to add this one to the list! This is such a great quilt design Paige! And i love it in red and white! This is a great quilt. I didn't actually notice it was a bear claw when I saw it in the book! Both of your festival entry quilts are amazing Paige. Very different, but equally great! One of my favorites from the book! 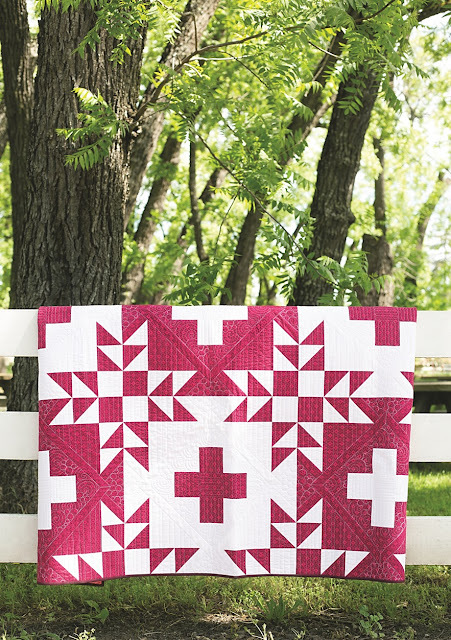 I love the colors you picked, the perfect piecing, and Johellen's quilting!